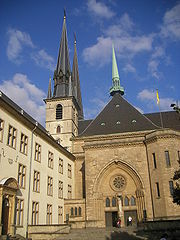 One of the Europe's smallest sovereign states is The Grand Duchy of Luxembourg. The north part of the country is blessed with greenery and hills. 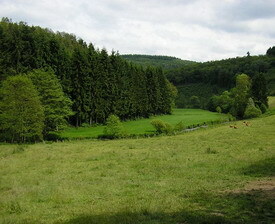 The Ardennes provides great scenic view. The country is small and all the tourist attractions are within reachable limits. It snows during the winters in Luxembourg, but isn't as cold as its neighboring countries and the summer is warm which comes in May and lasts till September. Incase of emergency dial 112 or 113. Generally handshake is used to greet people. Although majority of the locals speak English, Letzeburgesch is the national language of Luxembourg. French and German is also spoken by many Luxembourgers. When appearing as a guest at someone's house, it is a good practice to bring along gift or flowers. People are expected to dress in smart casuals, but it would be best to turn up in formals when attending social functions, or clubs. It's not advised to smoke in public places. Crystals and porcelains of Villeroy and Boch are very famous and the earthenware pottery from Nospelt is a shopper's must have item from Luxembourg. VAT of 15% is applied to all items purchased other than that from campground, hotel, and restaurant, which charge 3%. Tipping is exempted. The capital, Luxembourg is a place to be. Stay for a day or tea to explore the city. Village of Viaden has a cliff top castle which is a famous landmark. 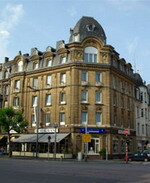 Luxembourg has many luxurious hotels, most of which are located in Lux City. Other options are guesthouses which are beautifully decorated with flower and plants. The national airline which operates here is Luxair. There are flights from London to Luxembourg every hour. The Luxembourg airport is at a distance of 5km from the city and it takes about 20 minutes to reach there. There are provisions such as duty free shops, bank, tourism information and car hire for the passengers. Eurostar provides a fast railway service from London, Paris, Belgium, France or Brussels to Luxembourg. Bookings can be made via telephone and £5 fee is charged for telephonic booking. Check out for offers which are provided on some of the routes. To travel within the country, Inter-Rail pass can be bought which gives the offer of unlimited train travel for 29 countries of Europe. When driving on road, it is recommended to take the train or ferry service when passing the channel between Dover and Calais. Check out for vacancy before hand especially during the rush hours. While driving, drivers should stay on the right side and there are strict rules for drinking while driving and seat belt. 1. 200 cigarettes or 100 cigarillos or 50 cigars or 250g of tobacco 2. 1liter of spirits or 2liter of sparkling wine or 2liter of liqueur wine and 2liter of non-sparkling wine 3. 50g of perfume and 250ml of eau de toilette 4. 500g of coffee and 200g of coffee extract 5. 100g of tea and 40g of tea extract 6. Tobacco and Alcohol can be carried by visitors over 17 years of age only. About the Author - Learn about miniature turtles, teacup pigs and other information at the Interesting Animals site. 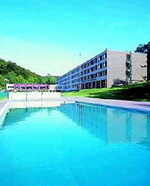 The Parc Hotel is ideally located near the Grengewald, Luxembourg's largest forest, in a unique leafy setting. Situated 10 kilometers from the international airport, the hotel is conveniently close to central Luxembourg, the European Center and the fairgrounds. The hotel features a very good selection of amenities, but the relationship between service and the price is especially nice. The recreational facilities at this hotel are substantial - both indoor and outdoor swimming pools, a solarium, gymnasium, sauna and a tennis court. The immediate area also offers a variety of recreational activities. 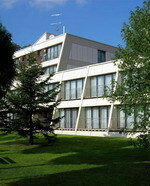 The Parc Hotel, Luxembourg has a restaurant, facilities for laundry, conferencing, and access for the disabled. A buffet breakfast is included in the nightly rate. The hotel is convenient to fine dining, shopping and entertainment venues. The Golden Tulip Central Molitor, Luxembourg is a business and tourist hotel ideally situated halfway between the financial, the main business district and the railway station. Tourist attractions such as the fortifications, the casemates, the narrow streets of the old city, the Grand Ducal Palace, the Cathedral and many other interesting sights are just a 5-15 minute walk from the hotel. The Luxair shuttle and air terminal are just 300 meters away for your convenience. Whether your stay is for business or pleasure, you are sure to enjoy being a guest here. An in-house TV program keeps guests informed of the latest hotel and restaurant news. A number of non-smoking rooms are available. Room and laundry service are at your disposal. A well-trained staff is ready to assist you in any way possible. The hotel is just moments away from fine dining, shopping and entertainment venues. The Grand Hotel Cravat is located in Luxembourg City, Luxembourg, within 100 metres of the main shopping street and the cathedral, 150 metres from the old town, and one kilometre from the main train station. Luxembourg airport is eight kilometres away. 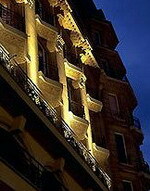 Built in 1933, the Grand Hotel Cravat has a city centre location overlooking the Petrusse Valley. The lobby is light and welcoming with antique-style armchairs, ethnic rugs, a marble fireplace and impressionist-style murals depicting rural scenes. Multilingual staff can arrange express check-in and check-out, concierge services, currency exchange and airport transport (surcharge). Other hotel amenities include secure valet parking (surcharge) and wireless Internet access. The Grand Hotel Cravat's restaurant Le Normandy offers the atmosphere of a grand, French ocean liner and serves French dishes. Brasserie La Taverne is frequented by locals and offers French and regional dishes, while drinks are served in the hotel bar Le Trianone, which has classic decor with leather, wood and marble. The Parc Plaza Hotel Luxembourg benefits from the magnificent greenery of the park. 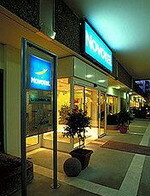 Conveniently located at a few minutes away from the main banking and shopping area. The Parc Plaza Hotel Luxembourg offers Comfort and Superior rooms. Come and have a drink in our bar Le Bateau Ivre, just within a few steps from the town centre, in a quiet and convivial atmosphere. Make the most of our panoramic terrace in leaf surroundings, with a splendid view over the heart of the city. In our restaurant Le Bec Fin, let yourself fall for our menu of the day or our buffet! In pleasant and cosy surroundings, you can be served traditional and French cuisine, with a variety of dishes at very attractive price. With a sublime terrace in a rural surrounding seconds away from the town centre, you will understand why this restaurant makes the detour worthwhile. The Mercure Grand Hotel Alfa Luxembourg is located in Luxembourg City, Luxembourg, next to the railway station and one kilometre from the city's main entertainment and business districts; the Luxembourg Findel Airport is 10 kilometres away. The hotel offers two meeting rooms, and the public areas have air conditioning and provide complimentary wireless Internet access. Aiport transportation is also complimentary. 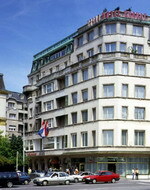 Mercure Grand Hotel Alfa Luxembourg houses the Alfa Brasserie restaurant, and the Bar Alfa serves snacks. Room service is also offered. The hotel's 141 guestrooms are climate-controlled, and all have direct-dial phones, complimentary wireless Internet access, satellite television, minibars, hair dryers, clock radios, and desks. 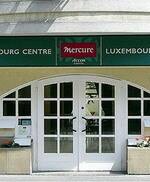 Mercure Luxembourg Centre is located in Luxembourg City, Luxembourg. It is one kilometre from the Grand Ducal Museum, two kilometres from central Luxembourg, and five kilometres from Utopolis cinema. This modern hotel has a bar, Bar de l'Hotel, serving a range of drinks and snacks; secure parking is also offered. Wireless Internet access is available in the hotel's public areas. The hotel's 68 guestrooms all come equipped with satellite television and pay movies, wireless Internet, climate control, and direct-dial phones. 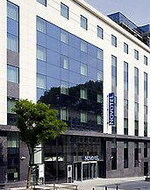 The Novotel Luxembourg Centre is located in Luxembourg city, Luxembourg, one kilometre from Luxembourg city centre and Palais Grand Ducal, and seven kilometres from Findel International Airport. The hotel has onsite parking, a fitness centre, and a 24-hour front desk. Wireless Internet access is available in public areas. The Novotel Luxembourg Centre's Red Square offers international dishes, while drinks can be enjoyed in the Red Square bar. 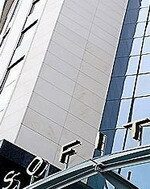 The hotel has seven meeting rooms with audio-visual equipment. Novotel Luxembourg Centre's 150 guestrooms all include wireless Internet access, direct-dial phones, satellite television, minibars, safes, and desks. The Novotel Luxembourg Kirchberg is located in Luxembourg City, Luxembourg, 800 metres from Philharmonie concert hall, and two kilometres from both d'Histoire Naturelle museum and Cathedrale Notre Dame. This hotel features 10 meeting rooms, and secure parking facilities are available. There is also an outdoor playground. Novotel Luxembourg Kirchberg offers the Cote Jardin restaurant, which serves international dishes for both lunch and dinner. The hotel's 260 guestrooms all come equipped with satellite television, wireless Internet, hair dryers, minibars, and desks. 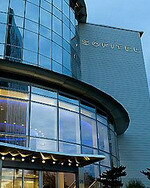 Sofitel Le Grand Ducal hotel is located in the centre of Luxembourg city, Luxembourg. It lies 300 metres from the scenic Petrusse Valley and 500 metres from the Grand-Ducal Palace. This seven-storey hotel features contemporary architecture and is part of the new Espace Petrusse commercial development. Multilingual staff at the 24-hour front desk can offer currency exchange, tour assistance and the use of a safe-deposit box. There is 24-hour room service and a dedicated concierge desk. The hotel provides a fitness room for guests. The Top Floor restaurant serves innovative cuisine in a contemporary setting with black lacquered panelling and excellent views. The Coco Mango Bar is also on the top floor with fabulous views, while the T'Room serves world teas on the ground floor. Highlights of Luxembourg cuisine include the spicy Thuringer sausage, Gromper Keeschelche (fried potato pancakes) and Quetsche Tort, a traditional plum tart.